Showing 1 - 3 of 3 Products for Sunroof Wind Deflector. The Thule 8703 AirScreen 52" universal wind fairing reduces noise, offers unique styling, and installs in about five minutes. 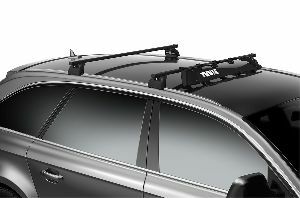 The Thule AirScreen Fairings are designed to redirect the air flow over your roof rack system, reducing wind noise and making your travel time more enjoyable. The AirScreen's universal hardware easily attaches without tools to any Thule Roof Rack. Thule's AeroBlade clamps provide full access to the upper T-Track for quick and easy accessory mounting and removal.